What does Vancouver have in common with Columbus, Chicago, Manchester, Winnipeg and Calgary? An opioid crisis. Whether it’s heroin, fentanyl, carfentanil, or spice, illicit substance use has taken a dramatic turn recently. Could this be a “canary in the coal mine” giving us clues into the current social cultural conditions and related systemic response? According to the BC Corners Report, there were 139 illicit drug overdose deaths with fentanyl detected from January through February 2017 which is a 90% increase over the number of deaths during the same period in 2016. Much of the discourse thus far on this issue has been focused on men’s use but it is also important to look at the specific dynamics for women. 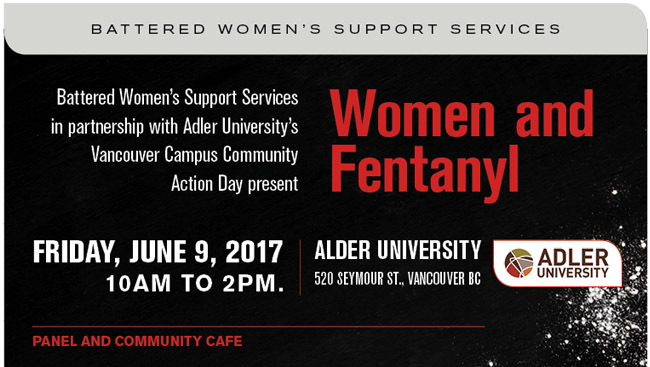 On Friday, June 9, 2017 Battered Women’s Support Services (BWSS), Adler University and Central City Foundation are coalescing the community on this issue and the specific factors for women at Women and Fentanyl Crisis Panel and Community Café. “This is a critically important event in aid of putting women's voices and women's experiences into the public realm. Our institutions, including the media, too often focus on numbers, not impact” said Janice Abbott, CEO of Atira Women's Resource Society “The impact of a woman's death can be far reaching and intergenerational. As a community, we need a considered and appropriate response”. In the late 1990’s and early 2000’s the City of Vancouver had a four pillar policy for substance use based on four principals: harm reduction, prevention, treatment and enforcement. Since then, The Four Pillars section of the City of Vancouver's website has no recent updates, there is no longer a drug policy coordinator and there haven’t been any recent progress reports on the policy. Women and Fentanyl Crisis Panel and Community Café will begin at 10am until 2pm with panellists Janice Abbott, CEO of Atira Women's Resource Society, Mebrat Beyene, and Executive Director of WISH Drop in Centre Society and Terriea Harris, Manager, Indigenous Women’s Program at Battered Women’s Support Services and emceed by Jennifer Johnstone, CEO of Central City Foundation. This event is a direct community based response to a serious social issue and is designed to help amplify community engagement. The book tells the lived experiences of Surrey residents from the Cloverdale and Strawberry Hill areas as well as from Historic Stewart Farm. Canadian Infertility Awareness Week (CIAW) aims to "start the conversation" about the current prevalence and treatment options for couples and individuals who suffer from infertility. Lilly will be at Chapters Metrotown to celebrate the publication of her new book, How To Be A Bawse: A Guide To Conquering Life. Lilly will be at Chapters Metrotown to celebrate the publication of her new book, How To Be A Bawse: A Guide To Conquering Life. Lilly will be at Chapters Metrotown to celebrate the publication of her new book, How To Be A Bawse: A Guide To Conquering Life.Lilly will be at Chapters Metrotown to celebrate the publication of her new book, How To Be A Bawse: A Guide To Conquering Life. The Monetize Me Now Summit will be one of the most moving experiences of your life, and will help you move farther and faster than you could ever do alone. Storytimes with iPads is a responsive and innovative program featuring a diversity of strategies that support early literacy.